Harry Hendrick has been working the same dead-end job for twenty years, recycling the same handful of stories over and over again for the local weekly newspaper. One morning Harry wakes up with a bad hangover and a strange tattoo on the back of his neck. When the next tattoo appears, he can’t blame it on the drink and begins to remember the nightmares that precede their arrival. As more tattoos appear, Harry finds himself drawn into the past of a man he never met, but who ran afoul of the same men who killed Harry’s career before he’d even graduated from university. With Australia in the grip of election fever, Harry and his small group of friends must find the reason behind the tattooed man’s disappearance before the men behind it become untouchable. Gary Kemble’s debut novel takes us to Brisbane where, in the sub-tropical heat at the height of summer, Harry Hendrick finds himself embroiled in something that he doesn’t completely understand. Just split from his long-term girlfriend, and questioning the decisions that have brought him to this point – a man in his late thirties with no ambition and little desire for change – Harry’s life is suddenly tipped on its head when it turns out he’s communing with a dead man whose tattoos seem to be appearing on Harry’s body. Throw in the fact that he’s suddenly the focus of some very bad men, and it looks like Harry could be having a bad Christmas, if he even survives that long. 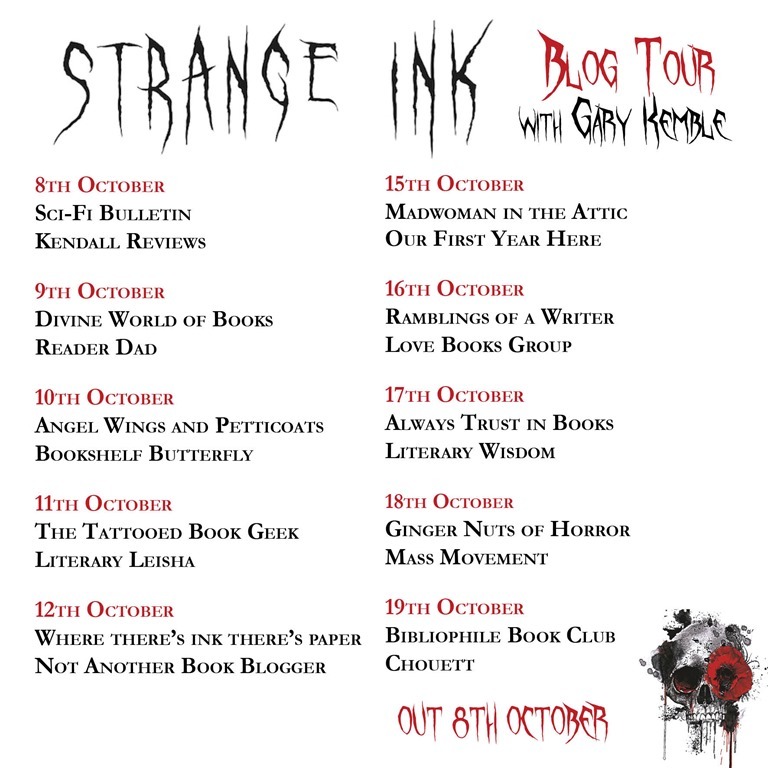 Strange Ink seems to have fallen into the horror genre by default when, in fact, it probably has more in common with the books in the crime/thriller section. Here are all the elements that we’d expect to find in a politically-charged thriller: the corrupt politician; the jaded journalist; the heavies sent to deter said journalist from his quest; the MacGuffin that will spell victory for whichever side finds it first (in this case, a set of documents). What sets it apart from the John Grishams and David Baldaccis is the supernatural element that drives the plot: the sudden appearance of tattoos on Harry’s body, always preceded by an intense nightmare that can only be the memories of someone else. While the story may have many elements that we’ve seen before, Kemble makes it his own through the interesting characters around whom the plot revolves. Harry himself is a likeable guy, a sort of everyman that every reader is likely to identify with in some way or other. The people with whom he surrounds himself – friends and colleagues – are all well-drawn and memorable, while the villains of the piece are a mixed bag, but no less memorable for it: the ex-military man running for office; the motorcycle gang members who are by turns sinister and bumbling, a sort of comedy double-act who make us feel very uncomfortable as we’re laughing at their efforts. Kemble’s writing is assured and contains a maturity not often seen in debut novels. Character descriptions and dialogue are spot on – it’s impossible not to put on your best Neighbours accent as you read – while the descriptions of Brisbane give us a sense of place throughout. The author does his best to put us in the centre of the story, to the point where we can feel the oppressive sub-tropical heat pressing down on us as we follow Harry around. The story grips from the outset: we’re thrown into the deep end as Harry experiences his first flashback/dream and wakes with his first tattoo. From there, we’re hooked, drawn into the story as a way of satisfying our need to know what, exactly, is going on. And Kemble does not disappoint. This is a story in which we are fully invested, and the fact that we don’t bat an eyelid at the supernatural elements is due to the author’s down-to-earth narrative style, and his ability to draw the reader into the story and immerse us completely in this strange new world. 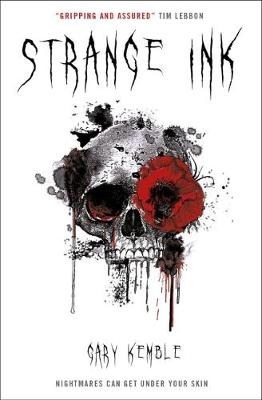 Dark and intense, but with an underlying humour, Strange Ink is an excellent introduction to Harry Hendrick and, indeed, to Gary Kemble. These are characters who – pun most definitely not intended – get under your skin, and our desire to find out what happens to them makes Strange Ink a truly immersive experience and an excellent way to step away from reality for a few hours. I’ll definitely be waiting for Dark Ink late next year, and in the meantime I can only urge you to introduce yourself to Harry, go for a coffee with him in Brisbane’s West End and enjoy the ride when things take a turn for the worse.